I know why very few magic dealers sell crystal balls -- it's really hard to get a good photo of one! But I tried to get a couple that show it off... not sure I succeeded. It is a beautiful 70mm (about 2.75 inches) diameter Italian crystal ball, made by Barbini in Murano. The pics may look like it has imperfections or bubbles, but it does not -- those are just reflections, etc. The ball is gorgeous. It is shown next to a poker size playing card to give it some scale. I think this is the perfect size for a crystal ball -- large enough to be impressive, but not so big that you need to get an extra deep close-up case. It has the usual crystal ball properties, allowing for images to be hidden and then suddenly magnified in view. The picture with the 3 of Spades showing is created by placing a teeny playing card (about the size of a postage stamp) under the ball. 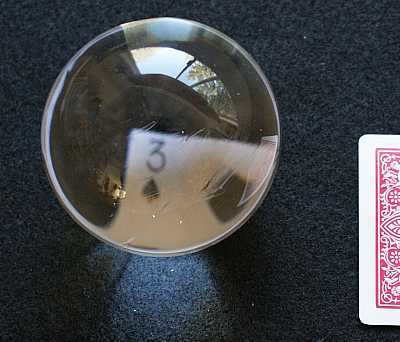 I will throw in a teeny deck of cards as a bonus when you buy this beautiful crystal ball. Barbini crystal balls of this size typically sells for about $55-60. Get it here for less.